Use these cold and flu sinus relief shower steamers when you need a natural decongestant. They release essential oils while you shower, which can help you breathe easier. When I'm sick with sinus trouble, whether it be from allergies, a sinus infection, or a cold, I am miserable. I turn on the cool mist humidifier and take my meds, but the thing that brings me the most relief is using my Breathe Easy essential oil blend. At the first sign of sinus trouble, I put Breathe Easy in my essential oil diffuser. This works well, but using the oils in steam seems to help better. Sometimes I use my bath salts for cold and flu, which works great when I'm achy and want to take a bath. But I don't always want to take a bath. Sometimes I'd rather take a shower. 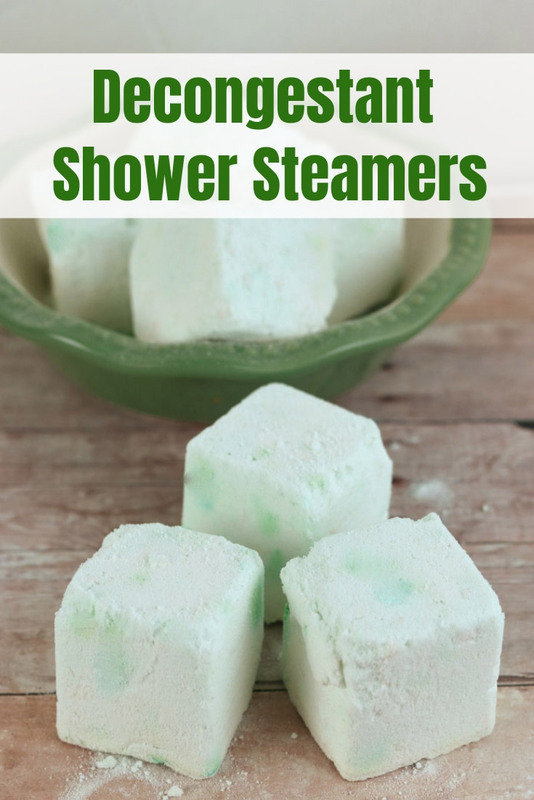 Whether you call these cold and flu shower steamers or sinus relief shower bombs or decongestant shower melts, they are wonderful if you have any sinus trouble. Although these cold and flu sinus relief shower steamers are made much like a bath bomb, they can't be used as a bath bomb. Bath bombs have less essential oils in them because you soak in the water. These have a lot of oils in them so they reach you as you stand in the shower. Please do not use these as bath bombs because you can irritate your skin with the extra oils! I didn't use citric acid with these because they don't need it. You don't get the fun fizz, but it really only lasts a few seconds anyway. These have one less ingredients, so they are easier to make. I don't know about you, but I always have baking soda and arrowroot powder in my pantry. I don't always have citric acid in my pantry. 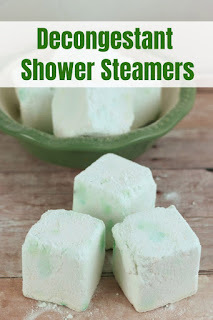 Shower melts made with citric acid are harder than these. I store these in a container so they don't get smashed and break. If they do break in half, they will still work. Just use both parts when you add them to the shower. Some recipes call for corn starch, but I don't use corn starch. Corn starch is almost always made from GMO corn, so I use arrowroot powder instead. The plant that arrowroot powder comes from isn't genetically modified, so I feel better using it. I was working on a sinus relief blend when I went to the store to get the necessary oils and discovered the Breathe Easy blend a few years ago. I've been a fan since then. It has a strong scent, and it does smell medicinal thanks to the tea tree oil. But it does work. You can also use eucalyptus essential oil , which is what is often found in most products for sinus relief. The oil works by combining with mucus to thin it, which makes it easier to expel. Peppermint essential oil is also a great oil to use. It acts like a natural expectorant to help you get rid of excess mucus. While not very common, pine essential oil is also one of the best essential oils for a cough or cold. It works as an expectorant and a decongestant to help relieve coughing. I sometimes use frankincense essential oil when I'm sick. It's a natural expectorant and an antiseptic to kill germs in the air. It's also said to help reduce anxiety, so it can be calming when you're sick. You can make your own blend for cold and flu or coughing. I used this ice cube style silicone mold for my shower steamers. One batch of these shower fizzies will fill two of these molds. Don't use these molds for ice afterwards. It should be delegated just for DIY bath and body recipes after you use essential oils in it. Combine the baking soda, arrowroot powder, essential oil, and soap colorant in a bowl. Wear a glove to mix it well with your hands. The soap colorant is optional. I added it mainly for the photos, but you can leave it out. I you do add it, really work it in and mix well. It can cause dark spots if it's not mixed well. These dark spots are perfectly fine and won't affect your final product. Add the water a tablespoon at a time and try not to dump it in one place. Keep mixing until it holds its shape when you squeeze it. Spoon into the mold. Gently press the mixture down. It should be packed in tight enough to hold together, but not so tight that the sides of the mold flex. If the mold flexes too much, they could break when you unmold them. Let sit for at least 24 hours before unmolding. Don't try to take these out of the mold early because they will break. Patience, grasshopper. Once they are dry, they should slide right out of the mold. If a few break, it's okay. Just use two pieces of broken shower steamer instead of one whole one. To use, place on the floor of the shower where the water won't hit it directly. It will melt slowly, releasing the scent and turning your shower into one huge diffuser. You might be tempted to add a lot of these to your shower, especially if you can't smell. You shouldn't do this or you risk turning your entire house into a really big diffuser. The rest of your family probably won't be very happy if you do this. 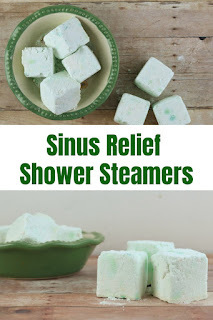 Don't want to DIY these cold and flu sinus relief shower steamers? I get it! To use, place on the floor of the shower where the water won't hit it directly. It will melt slowly, releasing the scent and turning your shower into one huge diffuser. Do not use these at bath bombs. The amount of essential oils is too high for using in the bath.